This iExpression links a 3D property to three different 1D, 2D, or 3D properties such that the X, Y, and Z component can be linked to different properties. Don't put a number here. 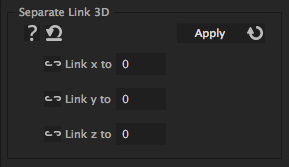 Use the link button to link the Z value of your property to some other property.